The 31 ORIGINAL PIECES for guitar by F. Tárrega are important representations of the Romantic epoch in the history of the guitar movement. They did not always reach us with the authenticity of their creator, however; quite the contrary, as only deficient and incorrect versions had been known up to now, a fact that has created confusion among guitar players. 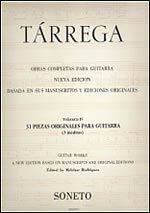 Today, thanks to the publishing of new editions based on Tárrega's manuscripts and original editions and the ongoing research carried out by young, promising guitarists, Tárrega is known and played by today’s best. His works are interpreted in many international concert halls, and recordings of them are heard worldwide. AII this has brought this important composer international recognition and deserved prestige.